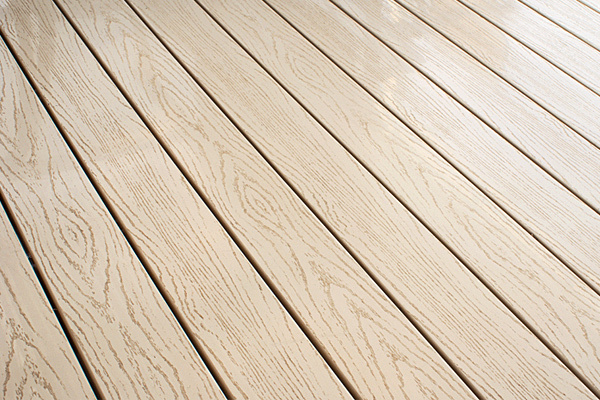 Find out why Country Estate Products is the vinyl fence and decking supplier in metro Atlanta to call first. With many styles, colors and options available, visit our showroom in Marietta GA for custom designs as well. Country Estate Vinyl Products are available in white, almond, gray and adobe. We have a variety of optional cap styles to choose from as well. And when your project plans for a privacy fence or a rail fence require a wood-grained look, simply ask us about streaking and embossing options for these fence styles. “Streaking” is a new process in which a darker colored pigment is streaked through either our almond or gray material to give a variegated, wood grain appearance. The surface of the material is smooth (although it is suitable for our new embossing process if you also want a simulated wood-textured surface) and it is the same quality material that we use in our solid-colored products. Streaking is available in almond or gray. It’s no secret that Country Estate polyvinyl fencing is beautiful, durable and competitively priced with redwood. It eliminates chemical cleaning and preservation treatments. Country Estate products are made from 100% virgin PVC. Without the need for waterproofing with sealants or chemicals, Country Estate fencing is a product you can enjoy with zero maintenance. Available in white, almond, gray, and adobe, stop by our showroom in Marietta to see the vinyl fencing that looks like wood. With many styles of PVC vinyl fencing options, see us for custom designs as well. Find out why Country Estate Products is the vinyl deck and fence supplier in Marietta GA to call first.